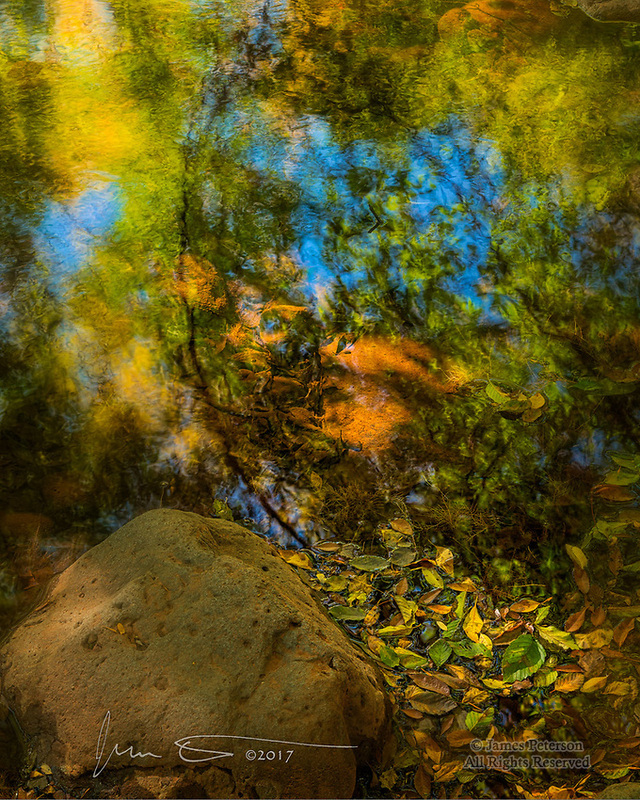 Autumn Reflection, Beaver Creek, Arizona ©2017 James D. Peterson. Fall color has come and gone in the higher elevations by now, but it starts later and lasts longer here in the Verde Valley. And it can be very captivating. The central Arizona territory in which I live is mostly considered a desert, but it is far from barren. Creeks and washes are lined with large, deciduous trees (e.g., cottonwoods, sycamores, oaks), and they teem with wildlife. They make elegant and serene settings in which to soak up their inherent natural beauty. My camera was irresistibly drawn to this rhapsody of floating leaves plus reflections of the trees they fell from, gently brushed with beams of sunlight filtered through the branches above. Monet would have felt right at home here.